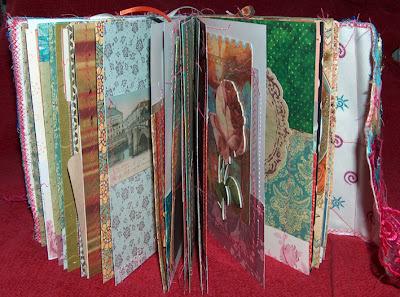 For over a year now I had been ogling the beautiful journals that were being made by people who took the online course Mary Ann Moss offered called "Remains of the day", not to mention the look of the journals of Mary Ann herself I'd encountered both on the net and in her books. I wanted to take the class, but was a little apprehensive since I took another online class that was only moderately to my liking. But last december Mary Ann put her online class on sale and I just couldn't resist. I had to know how these beautiful handmade journals were put together. So I joined the class hoping for the best. I did not really have time to get into it until two weeks ago and in those two weeks I have had the time of my life! Every left over hour was spent in my studio working on my very own ROD journal. Kudo's to Mary Ann, who's class is absolutely wonderful and very inspiring. She really takes the time to explain every little detail and shows it to you on dozens of video's and several pdf-files. I never had any problem understanding the process and found her very generous with her information. It turned out nicely thick and juicy and I just love it! 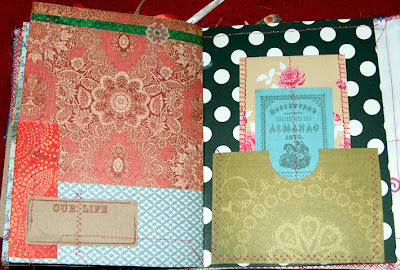 In a way the journal consists of two parts: a handmade fabric cover and this cover you fill with two paper signatures. Well the cover (inside and out) looks like this. The first is the book closed. The wrap around is a piece of lace I had lying around. I just love love love lace and always end up buying it if I come across it somewhere. 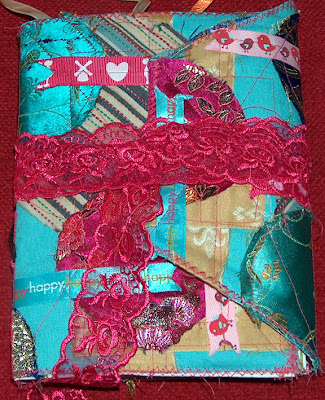 The cover is made up of all sorts of pieces of fabric I had lying around. 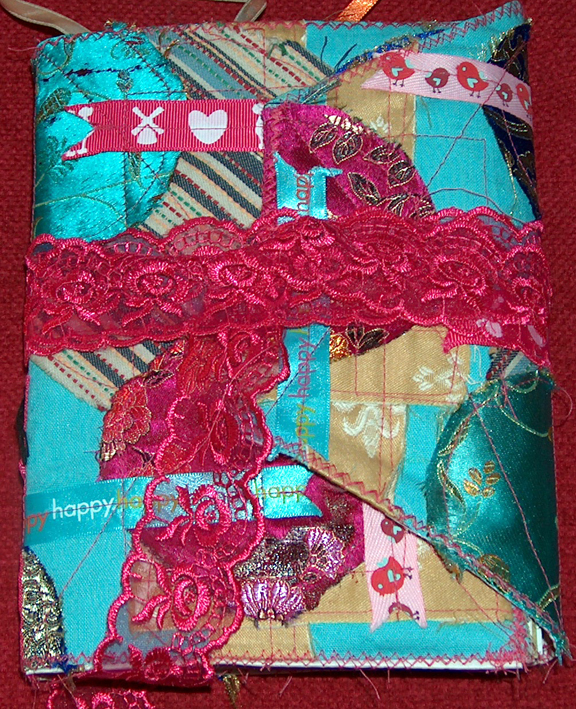 I embellished it with cut circles and ribbons (I like ribbon almost as much as I like lace). The inside of the cover is made with white fabric and some sheer lace with sparkles on it (which you can't really see very well). 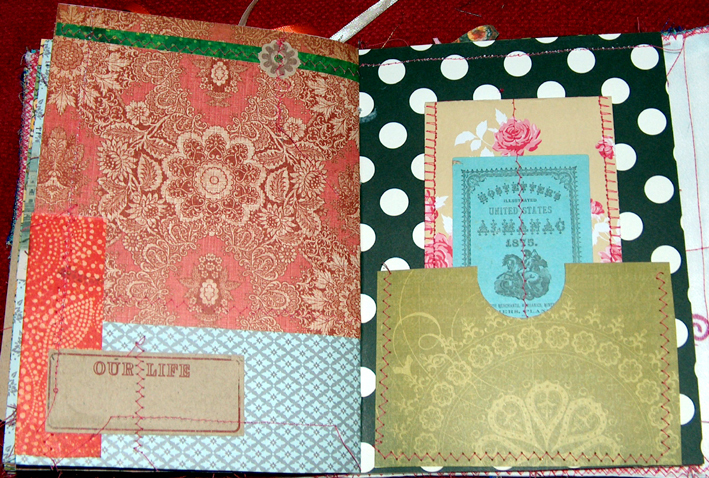 After I had finished the cover I stamped the inside with stars and swirls to give all that white a little more color. After the cover was done the real fun began, well for me anyways. 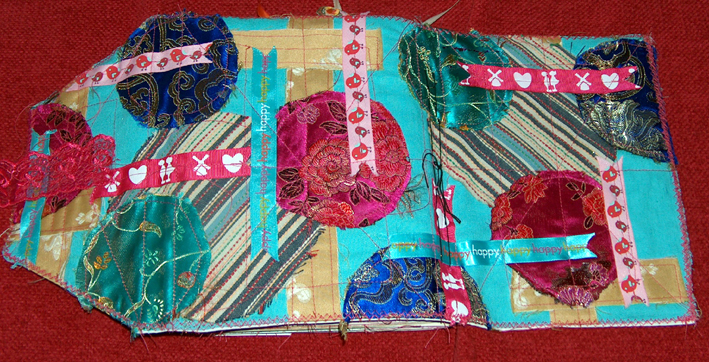 The paper signatures had to be cut, embellished and sewn into the book. Everything in this book is done with a sewing machine and mine was quite surprised to be used so much after being neglected for so long ;-). I never knew sewing paper was so much fun! 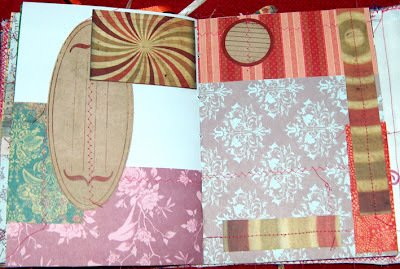 Although Mary Ann encourages you to use just any scraps you have lying around and this certainly gives wonderful results I simply had to use a selection of all the beautiful patterned paper I have lying around. 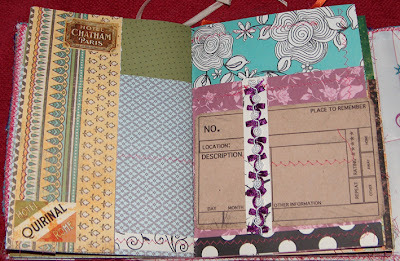 I am a paper addict and it would be simply inconceivable to use old scraps when all that paper was calling out to me. So now I have another excuse to buy more pretty papers, haha. 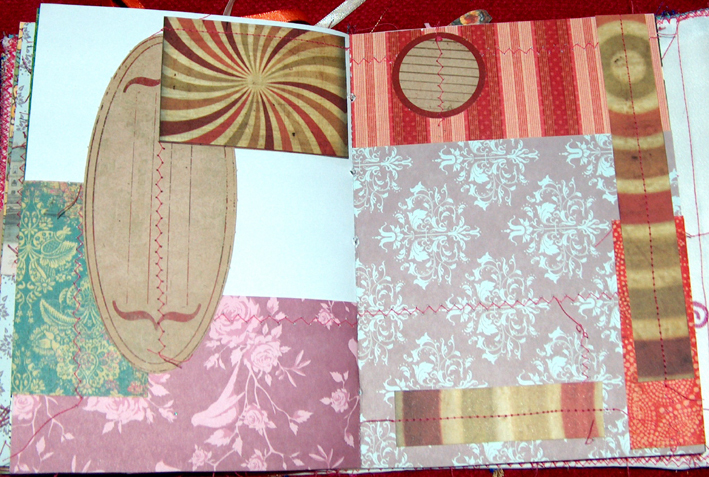 As you can see the book is full of little pockets and gadgets, which was such fun to do. 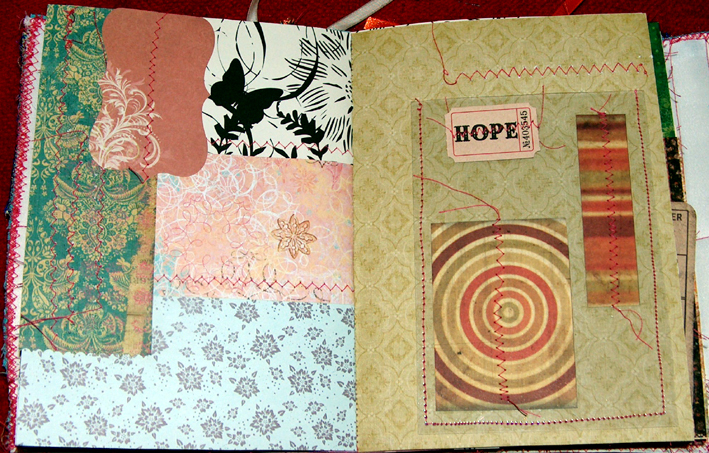 There are way more spreads than this, but that would be a little too much for one post (there are over 30 spreads in the journal). 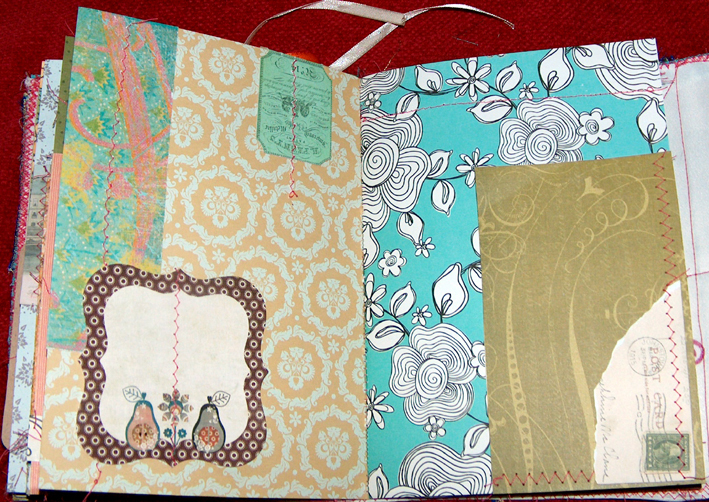 If you want to see all the spreads and pictures of this book you can go to my flickr. Just click on the link in the sidebar. All in all I am really happy with the result and I will enjoy filling it up (I already have a use in mind for it). 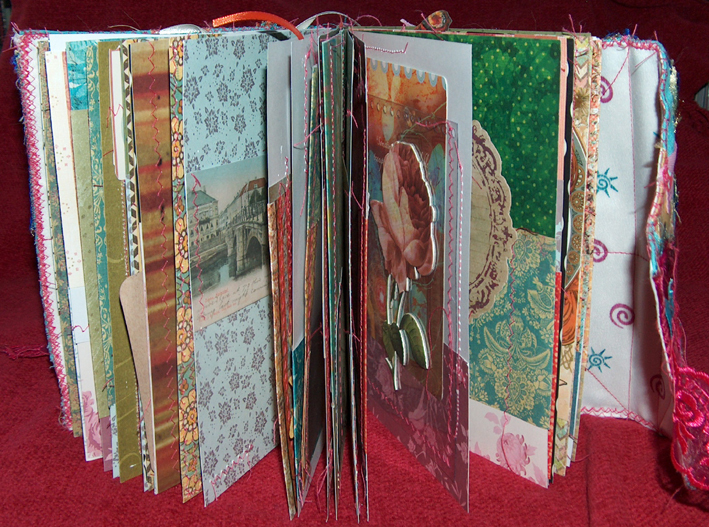 But most of all: I want to make more of these journals! They are just so rewarding to make and they would make great gifts as well. 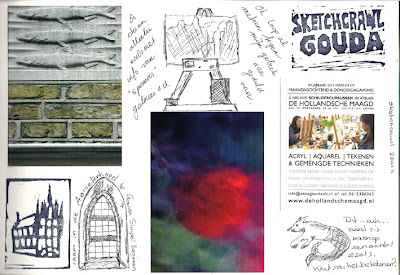 Last weekend, on saturday the 22nd, was a worldwide sketchcrawl day. For those of you who don't know what this is check out sketchcrawl.com. On this day people gather to draw together. My friend Monk and her friend Loes were brave enough to organize a Dutch version of this phenomenon and they did it in the city of Gouda. They put in a lot of effort and with no budget whatsoever got a lot of people involved and made it into a great succes. It was an absolutely wonderful day! 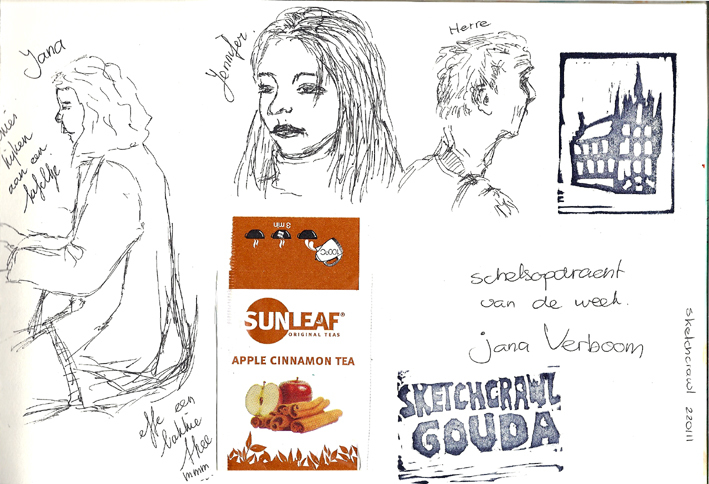 I spent the day with three people I had never met before and we just sketched, sketched and sketched some more. 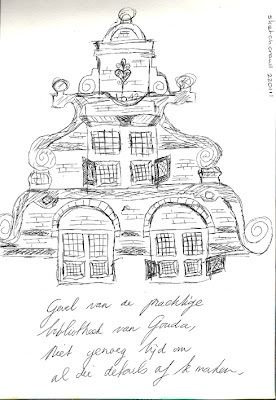 One of them even invited the rest of us at her beautiful home in Gouda. It was such fun and such a wonderful atmosphere, I will hold it dear for a long time to come. 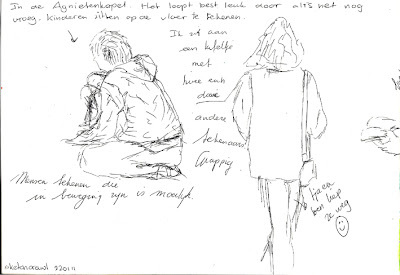 Dozens of people participated and it was great to walk the city and encounter people sketching all over the place. It was also a great day to ask other people about their journals and sketchbooks without feeling like an intruder. It was lovely to see how different people draw differently. Some are so meticulous and others like fast gesturelike drawings. But each was so talented in their own way. So here are some of my pages. I'm not showing you all of them, because some have personal information on them from other participants and I don't want to invade their privacy too much. 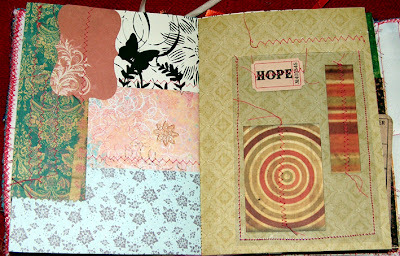 All were done in my heart journal. 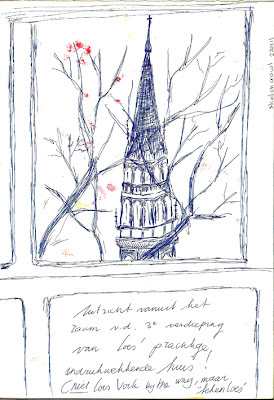 I started out simple with some very small drawings in between some pasted in business cards. The stamps on the top right and bottom left were made by my friend Monk from erasers. Are they cool or what? Sketching and walking around makes you hungry so we had lunch at the museum. On the table there were these pretty flowers and a little blackboard in the form of a teapot. It's the only sketch I colored in afterwards (with watercolor). 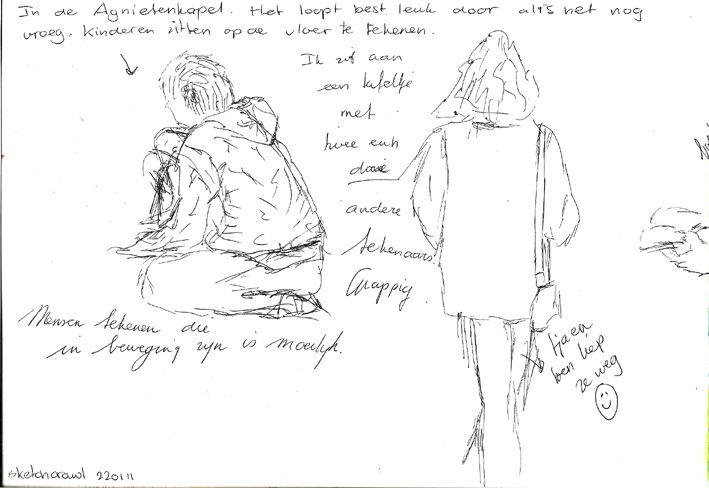 After we warmed up it was back into the cold where we sat in the museum's garden to draw the pretty things around there. 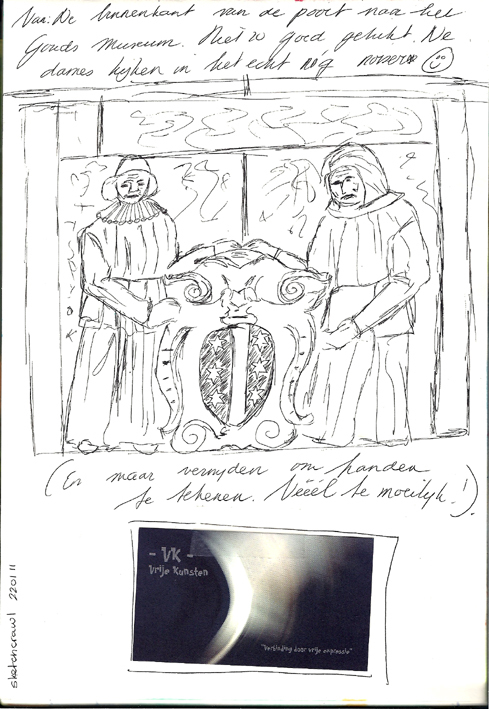 I drew a plaque that was affixed to the gate of the museum. There were two very grumpy old ladies on it. 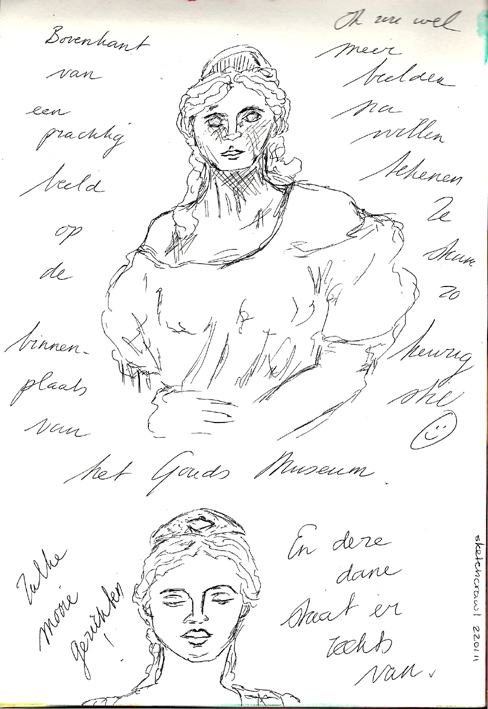 Fortunately there were also some beautiful young ladies to draw in the form of classical statues. As I state in the text I wrote to the side: it's way easier to draw a statue than a living person. Statues know how to keep perfectly still! 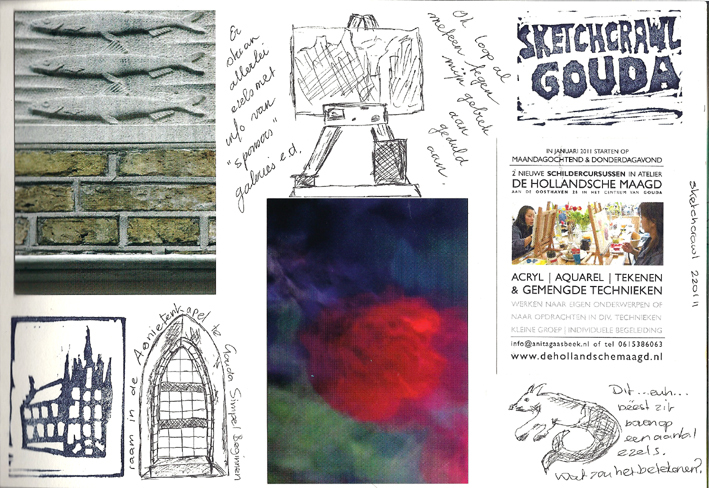 For those of you who are interested in seeing more pictures from the sketchcrawl in Gouda and also photographs, there is a flickr group and a blog devoted to it. ﻿Go check them out! 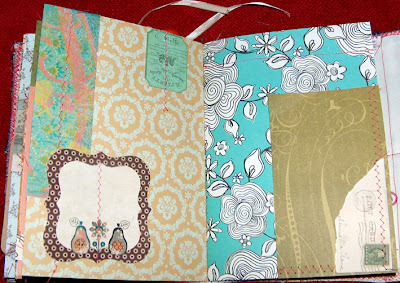 Here are some more spreads from the midwinter journal. I only recently finished it, because I still had some pages left over after my vacation. I'm always way too optimistic when it comes to filling journals, but still, this one only took about three weeks to fill. All in all not bad. On the left side of the right page of the next spread is the only drawing I did in this journal that actually represents something real, instead of being made up (like the houses in te previous post). It was done after a photograph I took on the walk I mentioned above. I pasted a part of that photograph in the top left corner. The righ side is just a little mix of stuff I had lying around. 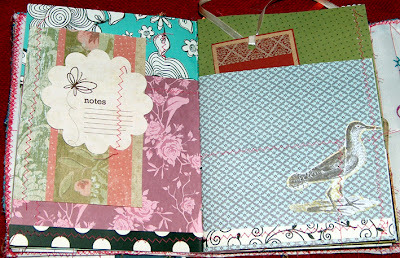 The left of the next spread is a photograph I took by mistake. I was holding the camera and accidentally clicked. When I got home I saw I had captured a seagull in flight. It's very small so I don't know if you can see it, but it made me smile, because often I try to capture seagulls in flight and I always miss them and now one just happened to fly by. The letter drawing on the right was just a little fun I had and yes, I know there is a HUGE spelling mistake in the text so don't contact me about my lack in the spelling department. It's the thought that counts (ahem). Now that I look at it, it seems I have done a lot of experimenting in lettering in this journal. Here's another example. 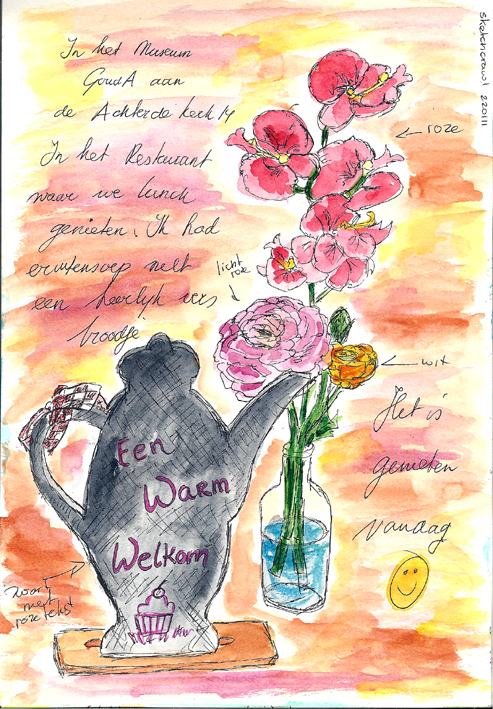 I was going through the Art Journaling magazines that Stampington publishes (love it by the way) and saw how some people made lines like this in their journal and colored them in. I love the effect, but, as I stated in the text on these pages, it is not a practical way of writing for someone who likes to write as much as I do. When I write I don't want to think about my lettering or how it looks. I just want to write. However, this kind of approach might work really well for a quote or something like that, and then you could also illustrate it a little more. During my vacation I kept a small journal seperate from my regular ones. It is a moleskine watercolor book. 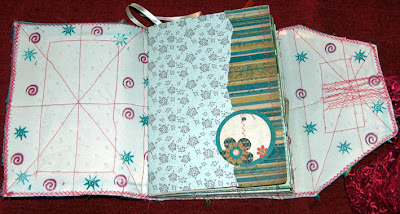 I called it the midwinter journal, because well...it was the midst of winter (yes, how do I come up with these things?). I will start with my favorite ones which are all drawings of little houses on a wavy line. I'm not sure what posessed me to make these drawings. I just felt like them and they were such fun to do! I ﻿used watercolor for the top and bottom half of the pictures and I colored all the details in with felt tip pens. I hardly ever use my felt tip pens, I felt like a kid with a coloring book! I definitely want to make more of these. Maybe I can even make some on a larger scale or somehow turn them into mixed media pieces. That should make for some cheerful art! I'm baaack (with some self portraits)!!! 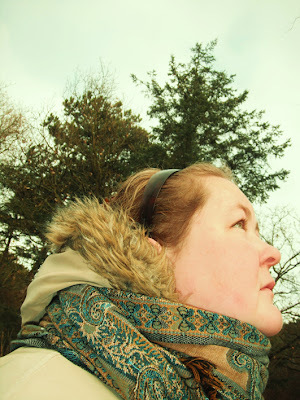 After an absence of about three weeks I am finally getting back into the blogosphere, yay! First of all I want to wish each and every one of you a very happy and creative 2011! Make it count! I had a very uneventful vacation, but luckily that was exactly what I was going for. 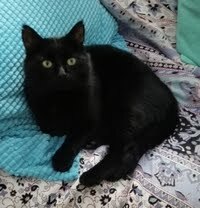 I needed a break from everything and I really got to rest and just live at my own pace (and not have workmen at my door every morning at seven, yawn). My own pace really consists of going to bed in the middle of the night and then getting up at about 9:30 am. I wish my job would allow me to do that every day. I'm such a night owl at heart, but a working girl can't really give into that can she? In my next life I want to be one of those energetic early risers! 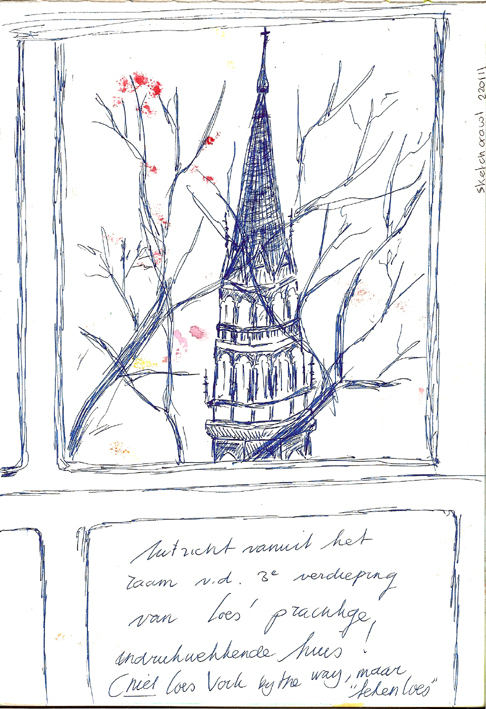 I had two blissful weeks of sleeping late, reading, taking long walks (when the weather allowed it that is, there were days when the roads were all ice), taking naps, reading a little more and every now and then I played a little in a journal. I did not work in my studio at all, but I did do a lot just sitting on the couch. 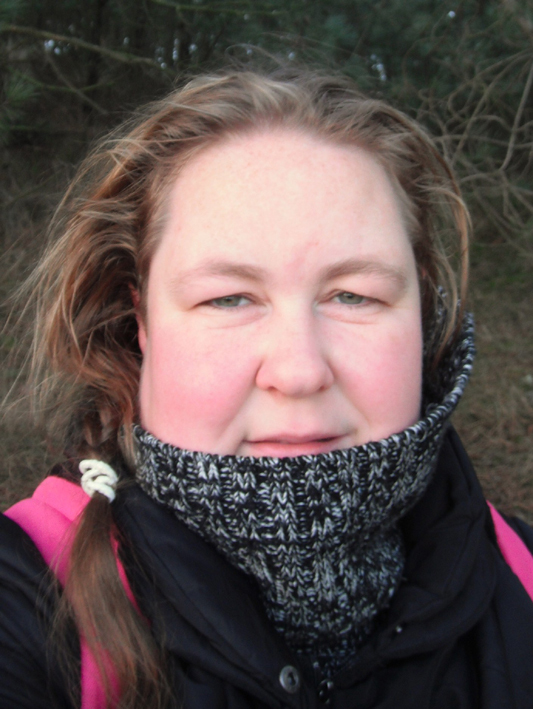 While hiking I also took many many, did I say many already?, photographs. One of my fun things this vacation was to experiment a little with self portraits. I don't really like getting my picture taken (I think this is a common thing among all people who like to take pictures, it's just an excuse not to be in them, haha!). 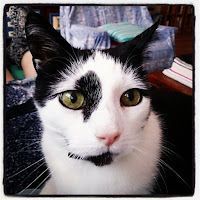 I'm not a pretty cutie fashion model, so I have no desire to look at myself so much. But it is interesting to see if I could at least make some pictures that I didn't want to toss in the garbage right away. I did okay and...it was fun! Here's some examples of how they turned out. 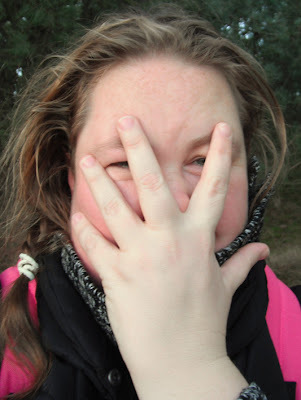 But I told her not be such a chicken and toughen up and face the camera! 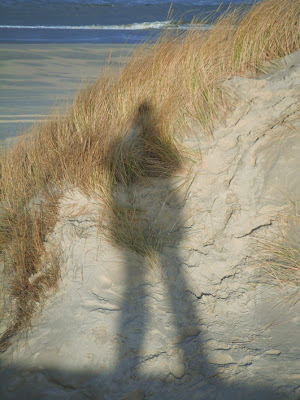 An interesting alternative to doing a straight forward self portrait is by doing a portrait of your shadow self. Of course this only works on beautiful sunny days ;-) And it's nice to have a bit of ocean in the background. 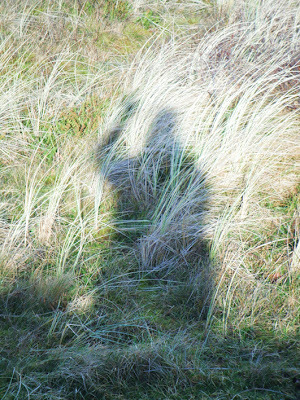 My shadow was getting in a good mood with all this attention and decided to give me a little wave. I also experimented with some different perspectives, this side view is one that I really liked. It may be the only picture of myself I am willing to frame someday. I took a lot more than these, but you get the idea. I would highly recommend trying it. It literally gives you a new perspective on yourself and it got me out of my comfort zone, which is a good thing to do every now and then. Aah, it's good to be back!